Through a magical book, two faraway children meet. This wordless picture book picks up directly where The Red Book (2004) left off: the third illustration in this is almost identical to the last one in the previous, with a tiny smile added. 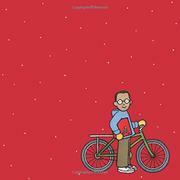 This time, a black child wearing a blue hoodie and glasses is the finder of the titular red book. The child bikes home through city snow and climbs the stairs of a quirky, cupola-topped house. Opened, the red book’s pages feature increasing close-ups that reveal a beige-skinned child in a fishing boat afloat off a faraway island. That child pulls in a similar red book from the sea and opens it to see the bespectacled city kid back at home. They’re looking at each other! Wordlessly, they form a mutual fondness. The kid in the boat finds an ingenious way to cross the world to their new friend—not through the book (it’s not that kind of magic) but, delightfully, towed by a pelican. There’s sadness and doubt during a brief period when the kids can’t see each other, and then there’s joy. Lehman’s illustrations are structured like comic panels, varying in size and shape and surrounded by white space; in watercolor, gouache, and ink she shows figures and landscapes with gentle textures and neat black outlines.